"I live in Pensacola, Fl. What's the best time to plant Gourds, and how should I care for them?" Gourds are very closely related to cucumbers, Squash and melons. They have a growing season of anywhere from 120-180 days, so you will want to get them started as early as possible. Sow your seeds outdoors when all frost danger has passed. Plant the seeds in full sun, about 10 to 12 inches apart where you want them to grow because they do not transplant well. Gourd seeds will germinate more quickly if you soak them in warm water for 24 hours prior to planting. Gourd vines will trail along the ground if no support such as a fence or trellis is supplied, but the fruit will often be misshapen and less perfect. It is strongly recommended that the gourds be grown on a strong arbor consisting of posts and several overhead crosspieces. The fruit will then hang down below the lattice. Gourds and most other vining plants are heavy feeders, so add a considerable amount of manure and compost to the soil prior to planting. When your gourds are well established, additional fertilizer is probably not necessary, but you may want to occasionally feed with a water soluble low-nitrogen fertilizer like 5-10-5. Avoid high nitrogen fertilizers because they will encourage leafy growth and actually delay fruit maturity. The male flowers appear on the main stem, while the fruit producing female flowers will emerge from the side stems, so when the vine has reached about 10 feet long you might want to snip the end to promote lateral side growth, and consequently, more fruit. DO NOT harvest the gourds when they are still green on the vine. Wait until the stem where the gourd is attached to the vine turns brown. Even though the foliage may be dead (such as after a frost) the vines can still feed the gourds water. 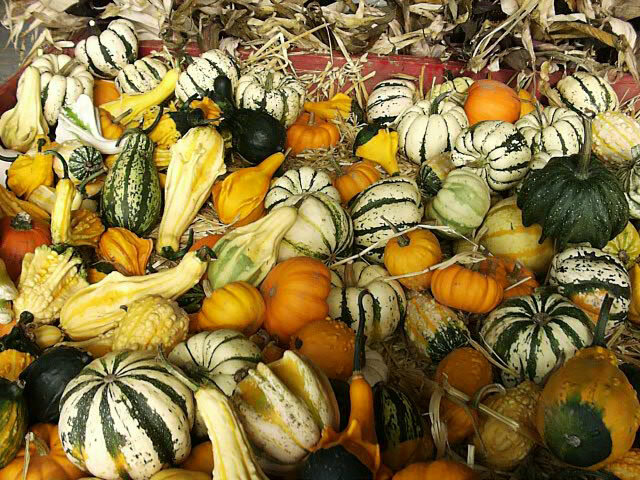 If you harvest gourds while the stems are still green, they will usually rot instead of drying. Drying Gourds properly takes months! Cut them off the vines, leaving a good size stem and place them in a cool, dry area with good air circulation. Turn them occasionally to help dry the bottoms. During the drying process, the fleshy part of the Gourd will begin to decompose and look moldy. This is totally normal and harmless because the woody part underneath is what gets used. Allow the Gourd to continue drying until the seeds inside rattle when shaken. To clean them, get a bucket full of water and pour a little bleach in it to kill the molds on the gourd. Soak the Gourd in it until the skin gets a little loose, then use a copper scrub pad like you use to clean pots and pans to scrape off the skin. Keep the Gourd wet as you continue cleaning until all is left is a woody looking gourd! Rinse and allow your Gourd to dry in the sun, then you'll be ready to paint, drill or carve it!